Maria Fousteri is a highly successful Greek molecular cell biologist who studies the molecular mechanisms of DNA damage repair in human cells and their protective roles “against mental dysfunction or cancer”. Her works in the field of nucleotide exchange repair and epigenetic chromatin remodelling, done at the Leiden University Medical Center (LUMC) in the Netherlands in the department led by the LUMC professor Leon Mullenders, appeared in elite journals such as Molecular Cell. These publications, described to me by a leading DNA repair researcher as “definitely major papers in the field” consequently helped Fousteri to an ERC starting grant of €1.5 Million for her research project “TransArrest” in 2012. Her young ERC-funded lab is located at the Biomedical Sciences Research Center “Alexander Fleming”in Greece, 20 km south of Athens. LUMC published the results of the investigation on their website on June 16th 2016. Especially the first paper, Fousteri et al 2006, proved to contain many instances of deliberate data manipulation (see details below). 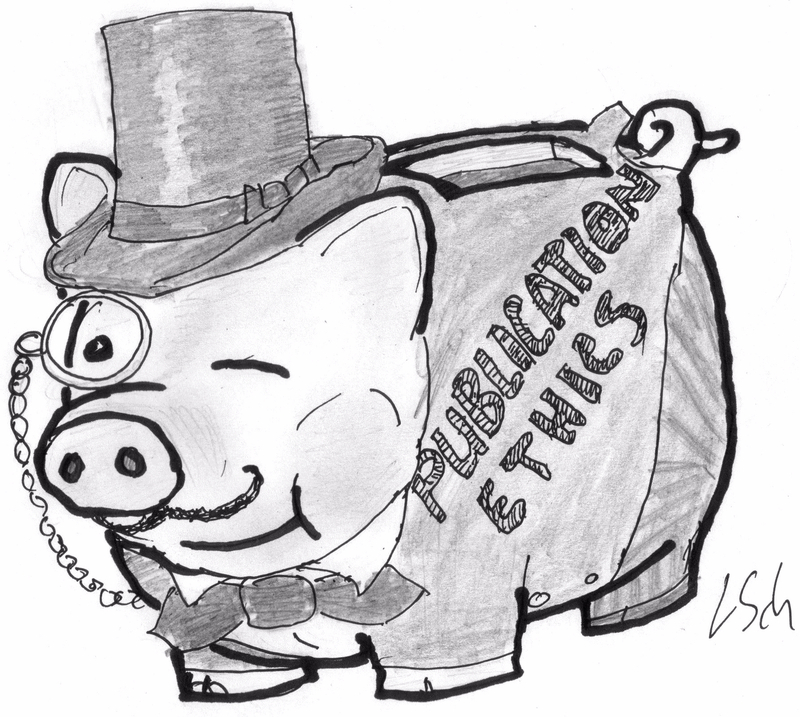 But also the other papers offered enough evidence of misconduct to warrant retractions. “Fleming is aware of this case and is currently looking into it. We will arrive to a decision after a careful and thorough review has been completed. Until then, as a matter of policy, we cannot make any comments”. It should be noted that the Committee has only been able to investigate a minority of the data that were presented in the publications, since in many instances primary data were lacking or not properly archived. The Committee did also not investigate unpublished data that were used in scientific presentations. Multiple instances of data manipulation have been found in all five publications that the Committee has investigated. These are clearly most numerous in two publications (1,2) [Fousteri et al 2006 and Moser et al 2007, -LS], which originated from the LUMC, that will need to be retracted. In two other publications the manipulations were less numerous (3,4), [Anindya et al 2010 and Ogi et al 2010, -LS] but still of a nature that the Committee believes retraction is in order. However, since these publications did not originate from the LUMC, which only provided part of the experiment, the Committee advises further action to be taken by the institutes in the United Kingdom, where the main responsibility for these publications lies. Finally, although not the result of acceptable practice, the irregularities in the fifth paper (5) [Theron et al 2005, -LS], for which the main responsibility also resided at another institution, led the Committee to suggest a correction to be sent to the journal in which the manuscript was published”. “The University of Sussex is conducting its own independent investigation. When this is concluded I will discuss with Molecular Cell the appropriate action to be taken with regard to the Ogi et al paper”. Fousteri’s former head of department Mullenders did not reply to my emails. According to the LUMC report, he told the investigators that “due to this autonomous activity of the defendant, he did not see the original experimental results, and therefore did not oversee the construction of figures from these for publications and presentations”. Several PhD students who worked in the Department’s section suffered by Prof. Mullenders and Dr. Fousteri did not complete their PhD, which in one case was directly related to the scientific misconduct reported here, as well as in unpublished experiments that have not been investigated by this Committee, and in one case was likely to be related to the way in which the leadership of the section operated”. The previous history of Fousteri’s Dutch PhD students makes it a matter of serious concern for the future of her current lab members. Presently, the misconduct -tainted group leader supervises five PhD students in her Flaming lab, plus four postdocs. “The ERC Executive Agency was not aware of the information mentioned in your email and we will assess it”. “We are aware of ERC policy regarding scientific misconduct and we will notify the ERC when we arrive to a decision”. With such schedule, ERC is unlikely to even consider terminating Fousteri’s undeservedly obtained funding. With their other misconduct cases, ERC was not necessarily in any hurry to block the money waste. Especially since Fousteri’s EU support is scheduled to end in October 2017 anyway, little can be expected also here. Another elite research project will be concluded and become just another EU statistic. There can be however another interesting twist to this story, since all four papers to be retracted appeared in Molecular Cell at Cell Press. Their editorial offices are ultimately controlled by the Cell Editor-in-Chief Emilie Marcus, who displayed in many instances a mind-bogglingly tolerant (if not welcoming) attitude to research misconduct (for details, see my report here). It would therefore be hardly surprising if the retractions requested by the Dutch investigation and possibly also its Greek and British counterparts would not be forthcoming, at least as long as Fousteri opposes them. “0. Duplication of Fig. 1C CSA, right two lanes (normal) and Fig. 1B CSB, soluble fraction, right two lanes. Duplication of Fig. 1D RNAPIIo, pellet blot and Fig. S2C RNAPIIo blot. Duplications of part of Fig. 1B and Fig. 2SA. Duplications of part of Fig. 1D and Fig. S2A. Duplications of Part of Fig. 2A and Fig. 4A. Reuse of part of Fig. 3D top panel in Fig. 3E top panel. Possible duplication of images in Fig. 3A top panel and Fig. 5A, top panel. Duplications of part of Fig. 3D and Fig. 5C. Fig. 4D. CSB Panel Appears put together in an unusual way. Fig. 5C. P300 panel, tied in untreated normal and untreated CSA cell appear to be identical (mirror image). Fig. S2C and S2D, CSB panels are the same, albeit with different exposure. Fig. S2C and S2D, RPA panels are the same, albeit with different exposure. Fig. S2C and S2D, XPF panels are the same, albeit with different exposure. Fig. S2A and S2B, CSB panels appear the same. 15. Fig. S2C and S2D, RPA panels are the same, albeit with different exposure. Fig. S2A, lanes 1 and 4 are duplicated. Fig. S2A and Fig. S2B top panels are duplicated. Fig. S2D, duplication of two adjacent bands. The report was written September 1, 2015, but the articles are still not retracted or marked with an “expression of concern”. Why? This junk science is still cited and the dogmas grow even stronger! Do you have access to the uncensored report? If so, I will comment on this at PubMed via PubMed Commons. I am afraid the censored report is not strong enough evidence to justify a comment. This is interesting. I have in two occasions commented on articles that should have been retracted due to a publicly available report from the investigation. They were not changed nor banned. My experience is that they do not allow comments on suspicion of misconduct, but if there are evidence and an available report they will let it through. It is also important how you present it. In my comment I warned the readers and put a link to the report, and recommended not to cite the articles. Using PubMed Commons should be an efficient way to stop citations of work that is not trusted, so I hope we could still use this channel. Do you know if it could be possible to get the above mentioned report uncensored? LUMC now confirmed that I named the right person and the right papers. The also for some reason chose not to inform ERC of their investigation. “Thanks for your questions. Your mail to dr. Vrieling was forwarded to me. I saw you already published the article, but hereby our answers. “We only reviewed the articles which the author published while being employed at the LUMC, or shortly before. Therefore we could of course only inform those sponsors that contributed to the work reported in those publications. The ERC did not contribute to that work, and no grant from the ERC was awarded to the defendant during employment at the LUMC, so we were not in the position to inform the ERC, particularly since LOWI asked us to be specific in whom we informed. We did inform, however, with the full report, other institutions to which the author moved after employment at the LUMC, and recommended them to set up their own investigation. For your other question: Prof Mullenders indeed retired in 2014 after reaching the age of retirement”. In case you want to consider this option, at lifescience.net you can post not only comments, but write a full review, incl. attached images or files. The authors of the review are responsible for the content. Of course there are ToU one should stick to, but in principle the content stays online until someone complains in which case we look into the matter. It’s worth noting that this post-publication review feature didn’t gain much traction since we launched it, but in case someone is interesting in posting reviews to inform the community of misconduct, then we are all for it. PS: The whole thing is non-profit, of course. A short time table of the events. (1): a PhD student and a technician report suspicions of irregularities in the work of Maria Fousteri to the head of the Department in March 2011. (2): the head of the Department reports these issues in the work of Maria Fousteri to the Dean on 20 June 2011. (3): an ad-hoc Committee of Leiden finds irregularities but no definite proof of a breach of the scientific integrity by Maria Fousteri. (4): the Board of LUMC accepts the findings of this ad-hoc Committee in a preliminary decision dated 10 January 2014. (5): the former PhD student is not satisfied with this preliminary decision. He goes to LOWI for an appeal. LOWI has investigated this case and advises the Board to re-open this case and to conduct a thorough investigation. This LOWI advice is at http://www.lowi.nl/nl/bestanden/LOWIadvies2014nr12.pdf (in Dutch). (6): The Board accepts this advice from LOWI and asks on 20 November 2014 to the LUMC Committee on Scientific Integrity to start with this investigation. (8): The Board accepts the findings and the recommendations of the report in a preliminary decision dated 18 September 2015. (9): Maria Fousteri is not satisfied with the contents of the preliminary decision and files an appeal at LOWI on 12 November 2015. LOWI has once again investigated this case and their advice is at http://lowi.nl/nl/bestanden/LOWIadvies2016nr.4.pdf (in Dutch). LOWI has dismissed all rebuttals of Fousteri. LOWI agrees with the Board of Leiden that the report of the LUMC Committee is solid. LOWI advises to anonymize the report and to restrict the distribution of the unanonymized version of the report. This LOWI advice is dated 23 May 2016. (10): The Board accepts the recommendations of LOWI in a final decision dated 13 June 2016. This final decision is at https://www.lumc.nl/cen/att/80813053317221/1263833/decision-board-of-directors This formal decision was sent to Maria Fousteri which implies that Maria Fousteri still has an @lumc.nl account. (11): the 2016 advice of LOWI provides much details about the views of Maria Fousteri. (12): within the Dutch system, an anonymized version of the final decision must be published on the website of the University (and/or on the website of VSNU at http://vsnu.nl/overzicht-wetenschappelijke-integriteit.html ). It is up to the universities to decide to publish a full version of the report and/or of the final decision. (13): There is within the Dutch system no obligation for the universities to make public statements when there is not yet a final decision. The entire investigation (which includes the possibility of an appeal at LOWI) is thus confidential as long as there is not yet a final decision by the Board. It is amazing how often WB’s results are falsified in publications. This makes us think if the WB is still an appropriate research tool: it is time-consuming (compared to ELISA) and has a high demand in terms of experience of the experimenter. Additionally, it requires optimizing the experimental conditions (i.e. protein isolation, buffers, type of separation, gel concentration, etc.). In addition, other methods such as ELISA and quantitative mass spectrometry are much more precise and accurate although still perhaps more expensive. Does really nowadays WB results worth something? Just a litte nitpick: your paper 2. is missing the last author. The Accused! This western blot thing (whatever is that) seem to be unique tool to expose cheaters in few research fields. Why is that so difficult to make original instead duplicated ones? I regret also that cheaters can’t be exposed in other research fields where this fantastic method is not used. I wish that any research field had similar methods but, unfortunately, in many cases cheaters can simply multiply 1-2 numbers to make ordinary result into discovery. And to sleep well after that at no risk to be exposed…. That is a good question…we can ask the several WB cheaters being commented in this blog. Unfortunately, research misconduct is not only a question of picking up WB or IF images duplications, etc. Many times research misconduct is related with data fabrication and this is more difficult to check as many times access to original data is difficult and paper figures can be false but be “politically” correct.